Have you noticed how many of us give our homes a big ''Christmas'' spring-clean before the big day. My Mum pulls out all stops - dusting and cleaning the house from top to bottom, even doing all the windows inside and out (now that is keen!) Regardless of whether the Christmas celebrations are taking place at her house or not - it is immaculately spotless! Me, well, not quite so eager to turn the house upside down and inside out, except when it comes to decorations and the Christmas tree - now that's another story! But, I did think it was a good opportunity to give the shop a bit of a revamp. So, I've been busy playing ''changing rooms'' over the weekend - what used to be at the front of the shop is now at the back, and what was at the back is now at the front! A change can be quite refreshing and it feels like a new shop! I have some gorgeous work to show you this week. This is Barbara's ''Flower Girls'' quilt - she did this as a block of the month pattern and chose stunning soft florals to set off the stitcheries. 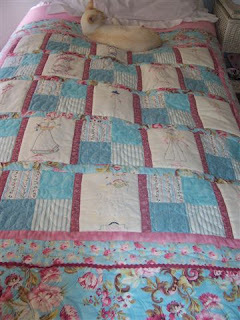 The quilt pattern is one of Brenda Ryans designs - a favourite of mine - and you can see more of hers at http://www.brendaryan.com.au/. And here's a couple of Debbie's latest creations. I love this hand-pieced bed runner - Deb said this was her first hexagon project - isn't it beautiful. This is her sampler quilt - fabulous colours. ..and the fifth Redwork Christmas block. I wonder how many of you have got Christmas projects to start and finish before Santa visits. I know I've got a few! One of the many fun parts of Christmas - picking the perfect project to stitch for that special friend, and then getting it finished, sometimes still stitching on Christmas Eve. Happy Stitching! Love the creations you show us, especially the Redwood Christmas block. Love the different colors red you used. Actually, everything you show is beautiful!